Computer disks have a finite capacity, and when they fill up it can lead to serious problems, including lost data and email. Actually it's slightly more complicated than that; disks are divided into partitions, and the problems ensue when an important partition such as one containing user files fills up. 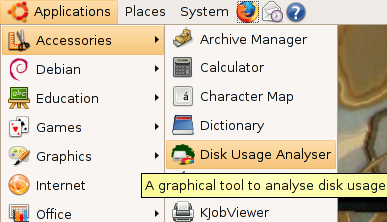 The utility will give you both a text version of the space and a graphical representation of the data that is on your hard drive. The df command displays information about total space and available space on a file system. Discus is a GPL text-mode disk space usage program.Discus aims to make df prettier. Features include color, bar graphs, and smart formatting of numbers (automatically choosing the most suitable size from kilobytes, megabytes, gigabytes, or terabytes). Or choose your own size, along with specifying the number of decimal places. I am totally new to GNU/Linux. I installed Ubuntu 9.04 on a Pentium 4, 256MB/RAM currently running Windows-XP. But I found that when I installed Ubuntu, for some reason it did not ask me for System-Disk-Space. Now that I want to install some Ubuntu-Updates, it asks me to free disk space from “/”, but I do not know how to do this. Can you pleas help? Thanks in advance. 9.04 has been a real problem starting with me upgrading from 8.10 to 9.04 with and ATI video card. Lost all 8.10 files (system bombed). Now, the same thing ( as above) happened to me on 2 machines, one xp desktop and one vista laptop. This disk space problem is an other unforgivable oversite. I am hoping that I can uninstall 9.04 on both machines and either go back to 8.10, or just give up on ubuntu. HDD4 – want to install Mac OS. i am totally new for linux and MAC, i have no idea about ubuntu and mac os. when i try to update “it asks me to free disk space from “/” ” after that i format hdd for the partition to make some space, after that i tried to reboot but never comes up even XP, vista, windows7 nothing worked. now i installed Xp, Vista and windows7 from scratch. for install ubuntu and mac os, please help me. Guys, it looks like you are installing your Ubuntu on very small partitions. You should probably be careful when you do your installation configuring the disk space that will be available for Ubuntu. I think Ubuntu definitely deserves a little effort on your side — it will deliver rewards that you can’t imagine yet. i think there is more interesting to using a linux. I have done a Windoze dumb trick that seems to have gotten me in a lot of trouble. OK, so much for the excuses. I highlighted a directory in Nautilus and then pressed the delete key. It APPEARS to have deleted the container(directory) ONLY. in the free space of that disk. trash would be a good first step. Typo alert; That should be “fsck”, NOT “fsdk”. Reg : Is this on a portable device such as a usb stick? Try to go in the menu to “View > Show Hidden Files” (or type ctrl-h). If this fails try creating a file with a special name, deleting it, and then searching for it. Also, if you want to permanently remove something, simply shift-delete just like in windoze. thanks alot. its so useful. Diablo 3 requires 12 gigabytes of memory. Does anyone know what is wrong? I really like ncdu. In a gui-kind of way you can really explore where the gigs at. Very friendly. Therefore you do not have the 12G space required.